The much anticipated sequel to China's 2015 box office hit Monster Hunt is coming to Australia on Chinese New Year Day. 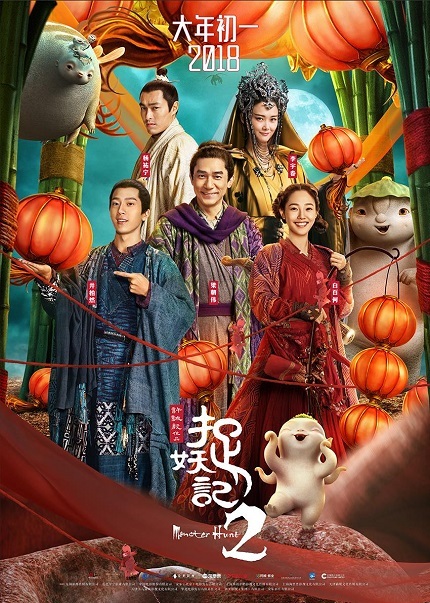 Directed by Raman Hui (Monster Hunt, Shrek The Third) and starring Tony Leung Chiu-wai alongside original cast members Bai Baihe, Jing Boran, Sandra Ng and Eric Tsang, Monster Hunt 2 looks set to become China’s latest blockbuster. The story continues with Wuba after he parts way with his human parents Tian & Lan for his own journey. Peace has not been restored in the monster world after the death of the evil monster king as a sinister lord has ascended and seized the throne. A heavy bounty is placed on Wuba dead or alive, forcing him to go into hiding again. He encounters an ill-famed gambler Tu (Tony Leung Chiu-wai) who's deep in debt & seemingly up to no good. Monster Hunt 2 will open in Australian cinemas on February 16 and this competition will close at 3pm on February 15. Good luck!